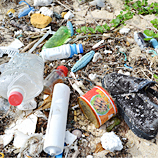 We need to clean the beaches periodically. 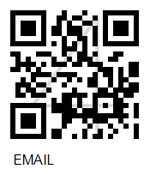 and harm marine creatures and ecosystems. 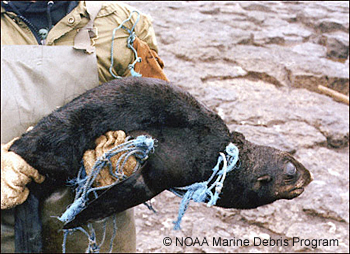 Many creatures are injured or killed from plastic wastes, toys, lighters, or fishing equipments that are washed onto shore or are floating in the ocean. The impact is large, no matter how small the piece of debris may be. We are responsible and are the only ones who can prevent this from continuing. Ignoring this issue will only bring us more serious problems in the future. We need to raise awareness of this problem and work together to help our planet and the many species living in it. 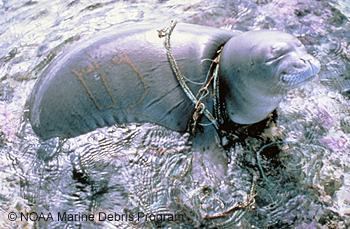 The photos below represent the condition of sea creatures all over the world. 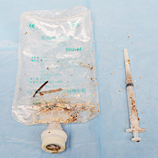 intestinal blockage from the plastic and Styrofoams found in the intestine. 2. Find ways to reduce daily waste. 3. 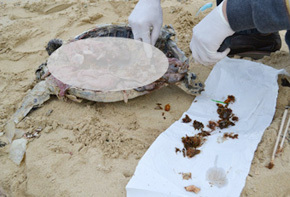 Participate in beach cleaning activities. 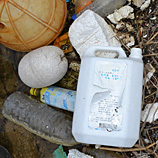 The following are groups of the most hazardous, high risk particles of marine debris ranked as “PRIORITY No. 1”. 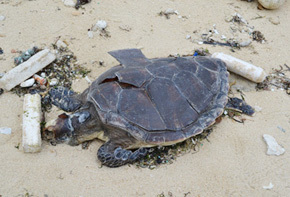 They are urgently in need of being removed from beaches before they return to the ocean by the next high tide. 1. 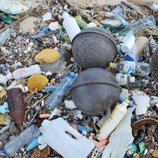 Since garbage flows and moves around in the ocean, it will take lots of time to locate specific areas of debris. A lot of money will be needed for this! 2. Scooping up all the debris may sound simple, but it's not! Surprisingly, there are many sea creatures such as plankton, jellyfish, as well as fish and coral eggs that live among the floating debris. 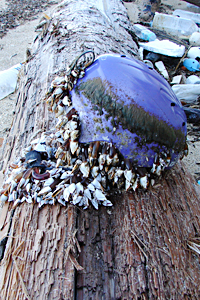 By scooping up the debris, that will mean that many sea creatures will be taken as well. This will harm the ecosystem. We cannot look at this situation lightly. 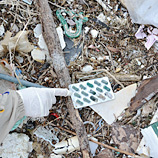 The best thing that we can all do is to stop debris from flowing into the ocean. 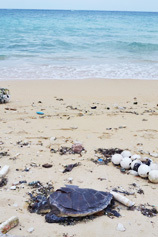 How long will it take to dissolve these marine debris? Miyako Island is geographically located by two ocean currents heading north. One of those currents is the Taiwan Warm Current in the East China Sea which travels north alongside mainland China. 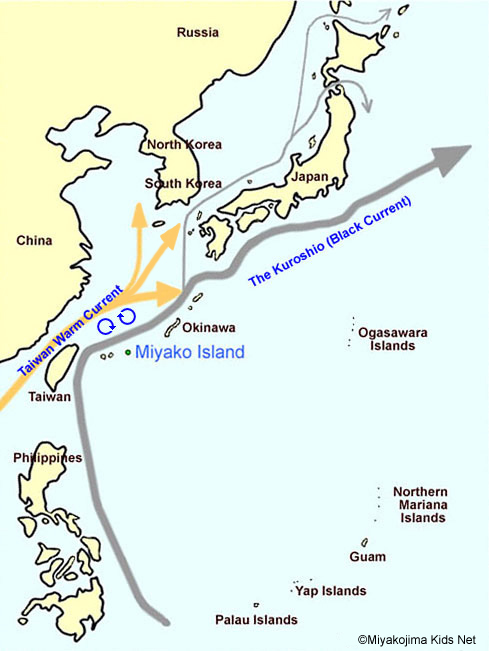 The other is the largest current in the world called the Kuroshio (Black current). It starts east of the Philippines and travels all the way up to the west coast of Canada and the United States. After 4.5 years, the current flows back to where it started. 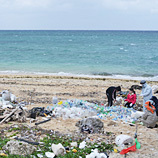 Drifting debris of the southeast Asian region flows past Taiwan and gathers near the sea of the Ryukyu (Okinawa) basin, including Miyako Island. Miyako Island is one of the best places for the “Exit Survey Base at the Gateway” for Drifting Ocean Trash (Marine Debris). 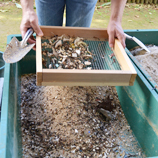 We research debris from the Southeast Asian region before they flow into the Pacific Ocean. 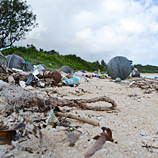 The marine debris will travel to mainland Japan and flow to the west coast of Canada and the US after two years. 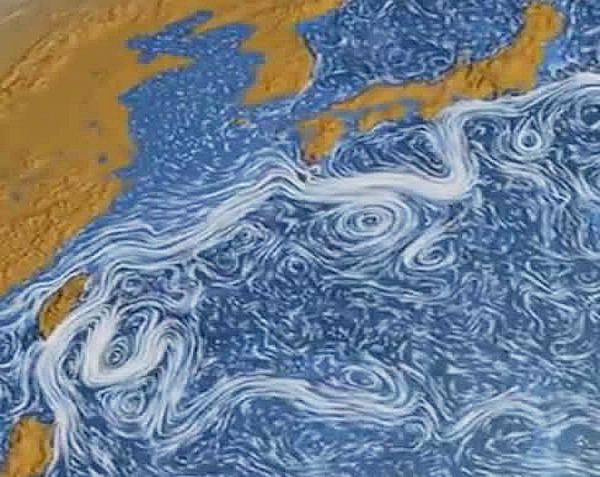 This image is a visualization of ocean current movements that was created by NASA's Scientific Visualization Studio based on data from June 2005 to December 2007. This image shows two large currents merging north of Taiwan and branch currents (split flows) starting to circle around Miyako Island and other neighboring islands of Okinawa. 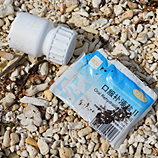 As a result, lot of Southeast Asian marine debris washes ashore Miyako Island. What are the “garbage patches”? 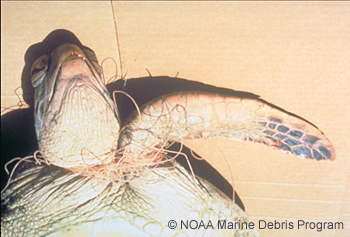 “Garbage patches” are concentrated areas of marine debris. 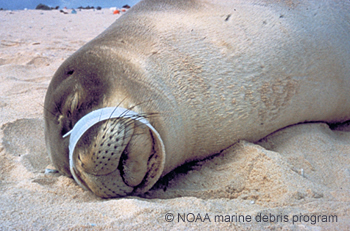 These patches of marine debris do not form islands or other large formations that can be seen by satellite or aerial photographs. 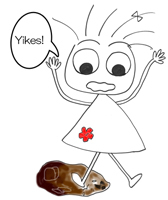 Though the specific locations cannot be specifically identified, there are two approximate areas of garbage patches. 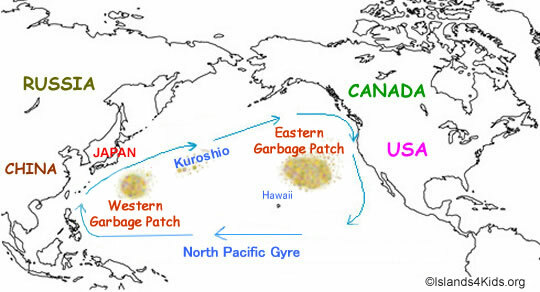 The “eastern garbage patch” is located approximately within the North Pacific Subtropical High between Hawaii and California. 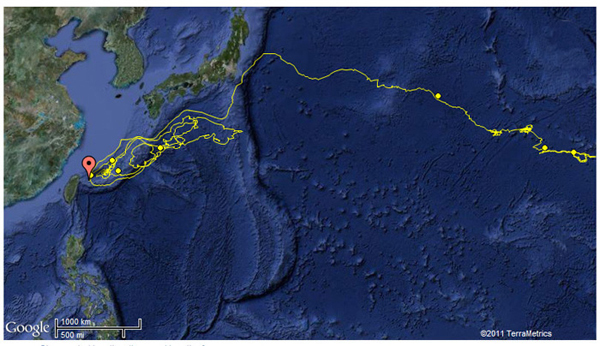 The “western garbage patch” may be located near the Kuroshio current off the coast of Japan. 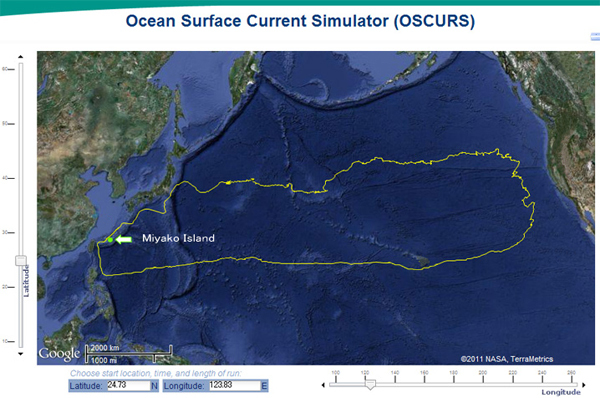 This photo is the result of our simulation using NOAA’s Ocean Surface Current Simulator to follow the movement of marine debris starting near Miyako Island.